It includes RBDoom3BFG, the Perfected Doom 3 Texture Pack, the Wolfen Texture Pack, the Monoxead Texture Pack, the AAA Doom High Poly Models, Phrozo Effects and various tweaks. It also has it's own installer. No gameplay changes, just graphics fidelity enhancements! You can read about it on moddb.com and download it here. It's only the mod, not the promised maps for the Starter Pack, but it's still Brutal doom! What is Brutal Doom? It's Doom, but the gore and action ramped up! It's one you must see to believe, so watch the trailer and download it! You can read the changelog by clicking "Read More". Treasure of the Hellbeast is a top/down monster smasher done by Shpuld for the Ludum Dare. The theme was “An Unconventional Weapon.” Ludum Dare is a game jam where you have 48 hours to make a game. Treasure of the Hellbeast is built with the FTE Quake engine. It got 38th place (out of ~1400) and had a 69% fun factor. You can download the game for Windows and Linux, and can also download the game code. Be sure to check out Ludum Dare, it looks like a really fun idea! Thanks to Quakeone for the news. Knightmare reloaded the latest version of his Quake 2 engine, version 20 Update 7. You can click “Read More” to see the changelog. It focuses on multiplayer as KMQ2 has been aimed at single player for a while now. Knightmare Quake 2 includes the Lazarus mod as the default game DLL, eye candy, transparent/animated surfaces, and other features. Check out it's website and give it a download! Thanks to Quake 2 Cafe for letting me know. Sergeant_Mark_IV announced June 5th is the release date. A trailer was released now (click “Read More” to watch). v20 will will have a Starter Pack that lets you “unzip and play” and will include 30 new maps. Brutal Doom is a Doom mod that required an updated engine (GZDoom for example) that ramps up the gore, firepower, and action from the original. It must be seen to be believed! You can download the latest release, v19, here. Motorsep has been busy working on his latest game, Phaeton. It's the sequel to Steel Storm: Burning Retribution. For these videos we're seeing GUI and inventory updates. 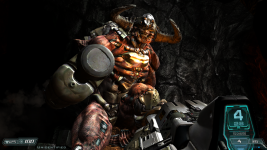 Phaeton is built upon the Doom 3 BFG GPL code with quite a bit of enhancements to make it play like a different game. You can keep track of it via the KOT Youtube channel and blog. Click “Read More” to watch the videos. Thanks to GameHacKeR from the comments for pointing it out (and me forgetting to see if Func_Msgboard has anything new :p ). SUPERQOT is a Quake mod that only lets the anything move when YOU'RE moving. That's right, if you let go of your mouse/keyboard, time freezes. Looks pretty sweet! It's based on the game idea in SUPERHOT. It includes Darkplace engine and Quake Shareware for you to start with. You can download Windows here, Mac here.